This series is great. I thoroughly enjoy they way in which Stiefvater writes. The story is compelling, and the narration is excellent. Love this series!!! I went through all of the books within about a week! Great book. I love this series and can't wait to get the last book. AWESOME BOOK!!! I loved it! The narrator was awesome as usual! It's been a while since I found a book I completely fell in love with. I highly recommend it! Will Patton did a wonderful job narrating. His use of accents, and various voices to portray characters was amazingly and creatively done. Bringing the characters to life. The story itself is a wonderful mixture of the supernatural, and the anxieties of a group of people and especially young adults that are dealing with what to do with their futures, love, death. The author does a great job at giving you a sense of how time is truly not just linear, and the effects it has on these young explorers. The story line is so captivating that the occasional loss of the narrative between the many side stories is only a minor inconvenience. A wonderful tale. This was my second listening of the story, and it won't be my last! I recommend the story and performance to all. Will Patton is such an amazing narrator. He really brings the books to life. And the narrator is absolutely critical to your enjoyment of any audio book. I hadn't heard of this series, but selected it simply because Will Patton was the narrator -- and it sounded intriguing. I've loved each of the books and have become a huge fan of the author now as well. I love Will Patton! He brings books to life. This is a great series also. Looking forward to book4! I have already read BLLB, but I decided to re-read it as an e-book. I really enjoyed it and liked the differences voices the narrator used, except for Gwenllian. 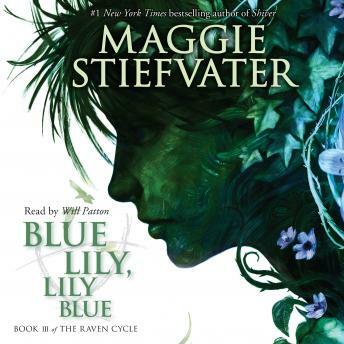 But, nevertheless, it's great to listen to the audiobook as well if you love this series!